We engineer robust supply chain and trading management systems for multimodal transportation plus storage networks including solutions for dispatching, asset tracking, EDI, inventory management, replenishment, purchasing operations, and logistics. Programming of custom software for operational activities including feedstock scheduling, dock scheduling, product blending, product distribution and delivering final scheduled quantities and allocations into dashboards with balancing and threading support. We develop comprehensive integrated refinery information systems by creating a centralized IT framework using Service-Oriented Architectures (SOA). Engineering of MES applications and tools to manage oil accounting systems and to optimize crude assays and its selection. We build custom software integrated dashboards for the entire process from crude procurement to product distribution including supply demand data, forecasting, backcasting, retro analysis and other LP model tools for evaluation. Programming of powerful Energy Trading and Risk Management (ETRM) business intelligence solutions with commodity analytics for Earnings at Risk (EaR), Value at Risk (VaR), margins management, forecasting, and regulatory compliance / reporting capabilities. We program document and contract management systems with digital audit trails, mobile / web eSignatures, routing approval engine and centralized storage repositories to consolidate document sources to allow for multi-tenant collaboration. 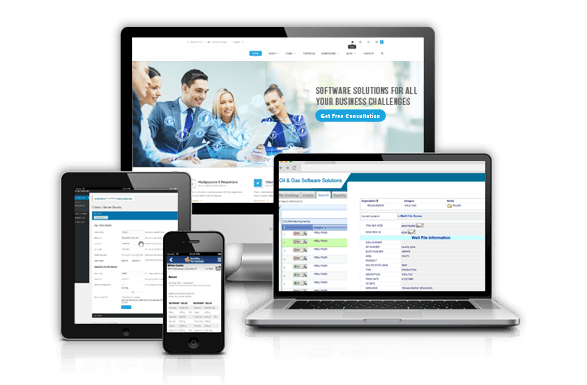 Coding of back-office accounting systems with modules for invoicing, payment settlement, inventory valuation, and hedge accounting with 3rd party software integrations. Development of retail management systems with EMV compliant Point-of-Sale (POS) terminal and gas pump solutions integrated to custom CRMs, fuel card loyalty programs and end-to-end retail automation solutions. Customization of an all-in-one portal for large customers and deregulated markets that enables online self-service with features to view real-time data, automated billing capabilities, and up-to-date contract terms. Consult with our custom downstream oil & gas software developers now to see specific examples of our work and discuss how our development services will help you.